We’d love your help. 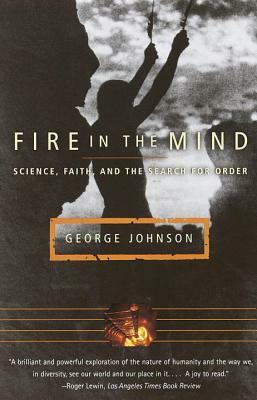 Let us know what’s wrong with this preview of Fire in the Mind by George Johnson. Are there really laws governing the universe? Or is the order we see a mere artifact of the way evolution wired the brain? And is what we call science only a set of myths in which quarks, DNA, and information fill the role once occupied by gods? These questions lie at the heart of George Johnson's audacious exploration of the border between science and religion, cosmic acc Are there really laws governing the universe? Or is the order we see a mere artifact of the way evolution wired the brain? And is what we call science only a set of myths in which quarks, DNA, and information fill the role once occupied by gods? These questions lie at the heart of George Johnson's audacious exploration of the border between science and religion, cosmic accident and timeless law. Northern New Mexico is home both to the most provocative new enterprises in quantum physics, information science, and the evolution of complexity and to the cosmologies of the Tewa Indians and the Catholic Penitentes. As it draws the reader into this landscape, juxtaposing the systems of belief that have taken root there, Fire in the Mind into a gripping intellectual adventure story that compels us to ask where science ends and religion begins. To ask other readers questions about Fire in the Mind, please sign up. Fire in the Mind is one of those books that make you want to read ten others. His main point is that the truth that you see in the world depends on the filter you’re looking through, and that both agnostic scientists and practicers of religion are struggling to impose their own sense of order on a messy universe. He delves into quantum mechanics and cosmology on one hand, and the intricacies of Southwestern religion (both Catholic and indigenous) on the other. He helped me to see that science is Fire in the Mind is one of those books that make you want to read ten others. His main point is that the truth that you see in the world depends on the filter you’re looking through, and that both agnostic scientists and practicers of religion are struggling to impose their own sense of order on a messy universe. He delves into quantum mechanics and cosmology on one hand, and the intricacies of Southwestern religion (both Catholic and indigenous) on the other. He helped me to see that science is not this absolute edifice of truth that we sometimes take it to be. On the other hand, Johnson describes the research of a set of scientists who believe there is order in the universe where mainstream scientific thought thinks there is none: in the origin and evolution of life. Their work hints that the arrival of complexity in the universe, and particularly in the form of life, is not necessarily the fluke it is sometimes made out to be, and that life in some form or another is inherent in the very structure of the universe. They are not anti-Darwinian, but they don’t think that Darwinian theory is sufficient to explain the diversity and complexity of life. I read the book primarily for these sections and I found them fascinating, particularly since Johnson doesn’t try to come down on either side. Some of the science described in this book can be a little difficult if you are rusty – I had trouble with the descriptions of quantum mechanics and I think Johnson isn’t the best in presenting unusual concepts in an easy to understand way. But I got enough out of his book to make it worth reading, and I plan to find a layperson’s introduction to quantum mechanics to clear my confusion. “It was the mathematician Claude Shannon, among others, who first embraced the concept of information to help us better understand how to send signals through the random noise of a telephone line. Information theory proved to be a powerful tool. Thinking in terms of bits has allowed us to develop the field of computer science, in which we learn how to represent the world with patterns of information. So successful are our endeavors that some physicists and computer scientists believe that perhap “It was the mathematician Claude Shannon, among others, who first embraced the concept of information to help us better understand how to send signals through the random noise of a telephone line. Information theory proved to be a powerful tool. Thinking in terms of bits has allowed us to develop the field of computer science, in which we learn how to represent the world with patterns of information. So successful are our endeavors that some physicists and computer scientists believe that perhaps information is not a human invention but something as real, as physical, as matter and energy. And now a handful of researchers have come to believe that information may be the most real of all. Simulated creatures would have no way of knowing they are simulations, the argument goes. And, for that matter, how do we know that we are not simulations ourselves, running on a computer in some other universe? This book is beguilingly written. It offers no less than a common framework for the pagan religions of native America, the sanguinary absolutes of Catholicism and the methodological naturalism of Science. At Santa Fe, the three meet on the same piece of territory but never quite in the mind. Nevertheless, they are all sparks of that common fire - the quest to see order in the world. I found it a surprisingly slow read considering that it covered familiar science and is rivettingly written. There This book is beguilingly written. It offers no less than a common framework for the pagan religions of native America, the sanguinary absolutes of Catholicism and the methodological naturalism of Science. At Santa Fe, the three meet on the same piece of territory but never quite in the mind. Nevertheless, they are all sparks of that common fire - the quest to see order in the world. I found it a surprisingly slow read considering that it covered familiar science and is rivettingly written. There are two possible explanations: The first is that I am getting old. The second is that the book actually makes one think. I'm inclined to put it down to a mixture of both. The author treats with the creation myths of the Tewa, the Church and of cosmology. While I do not feel that he makes the mistake of placing the former two on the same level of credibility as the last, he does highlight some important commonalities. Fundamentally, all arise out of a quest to see order which may ultimately be creating it where it is not. Fundamentally, our nervous systems always stand in the way of complete certainty that what we order is in the world and not in our minds. Fundamentally, the empiricism of science is a compromise. Still, the author is well-versed in science which spans a range from quantum physics and cosmology to evolution. He knows his stuff. This was an interesting book that explores the notion that man needs to make order out of all things. It questions if there are really laws that govern the universe or if we are using science to establish and order and to try to explain life. Furthermore, the book also discusses religion as another form of creating order, along with culture. A refreshing change from the pure science realm. Really outstanding - phenomenal. A discussion of how quantum mechanics and evolution come together in modern views of the centrality of information processing and inherent hierarchy informing the origin of life. Fantastic! an amazing trip through fringe physics and human spiritualities. The book is a sweeping collage of historic geology, epistemology, and science. The writing is poetic and dense. It is a multi-course banquet of ideas which must be savored slowly. Sparked a lively discussion in my men's book group, but a bit too dense a work for non-scientists to wade through. science and fatih really can combine and thoughts might have mass. He says Catholicism, New Age shamanism, Indian superstition and quantum mechanics are the same thing. Not quite I agree. The depth of detail is sometimes tedious but there are a lot of interesting ideas. Heavy read. Very thought provoking. A book which elegantly expands on the title. A brilliantly written beautiful read. This books dares to point out the constrictions and facilities in the Abrahamic religions. If you are a christian, I dare you to read it with an open mind. This book definitely rocked my "science versus religion" mentality. I seriously enjoyed it; shifted my way of thinking and expanded my perspective. George Johnson (born January 20, 1952) is an American journalist and science writer. He is the author of a number of books, including The Ten Most Beautiful Experiments (2008) and Strange Beauty: Murray Gell-Mann and the Revolution in 20th-Century Physics (1999), and writes for a number of publications, including The New York Times.